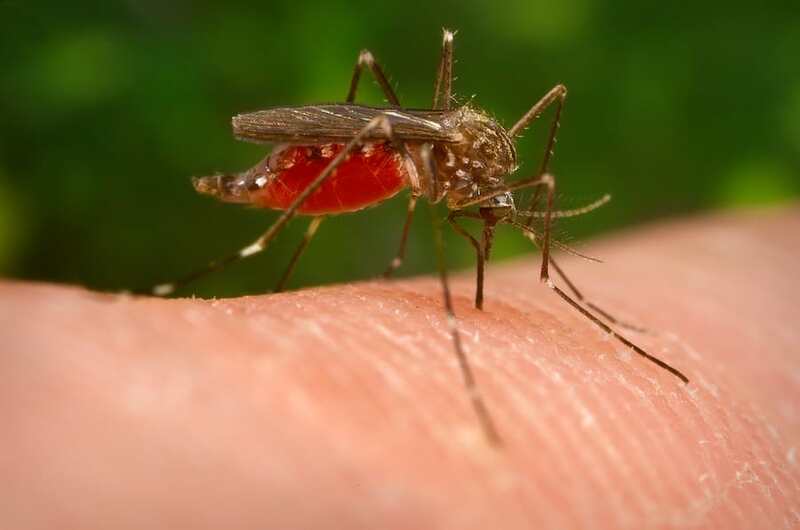 We're all familiar with mosquito bites, but are there other insects that can create similar effects and discomfort? There are many insects which bite, some do it to feed and others when threatened. One thing they have in common, though, is that they leave an annoying, itchy mark. Let's take a look at some other insects that can leave bites. What Other Insects Can Cause Itchy Bumps on the Skin? Unfortunately for us, many insects like the taste of our blood. This means, that during the warmer months of the year in particular, we might experience many bites, along with the subsequent discomfort. The following insects are all guilty of leaving us marked in a similar way mosquitoes do. Bed bugs are very small insects. They have an oval, flat shape and are no bigger than 0.25 inches long. Bed bugs are a reddish-brown color, and their abdomen usually expands somewhat after feeding. These little critters can't fly so they are entirely dependent on the movement of their host to get around. Don't let their cute name fool you, bed bugs don't just like to live in your mattress. They can also be found on other furniture, such as couches, and in places like thick carpets. Once you're asleep, or not noticing, bed bugs will come out and bite. Like mosquitoes, bed bugs feed on blood from humans and animals. They leave red, itchy bumps that can be quite uncomfortable. Most people don't even realize they have bed bugs. Since they bite while you’re sleeping, you're left with a few questions the next morning as to what bit you—and why it's so itchy. Bed bug bites are similar to mosquito bites. They are red and about the same size of a medium-sized mosquito bite. The tell-tale sign that usually gives bed bugs away is the pattern of the bites. Bed bugs often bite as they move around, feeding a little from each site. You might wake up with something akin to lines running all over your back. You may also notice dark spots on your bedding or furniture, these are the bugs' droppings. Some people may not experience any side effects from bed bugs while others are not so lucky. People with severe reactions can find themselves with rashes, blisters or hives. The bites could also darken in color and become more swollen. Bites usually occur on exposed skin, typically the arms, legs, face, and neck. Although, the back is also easily exposed, especially if you sleep wearing loose clothing. The effects of bed bug bites don't always appear immediately. In fact, it can take several days before you see or feel any effects. Some people, however, might experience an immediate burning sensation around the bite site. Bed bugs aren't all bad though. They don’t spread disease, and they're kind enough to inject a small amount of anesthesia into each bite so we won't feel it. Fleas are tiny, persistent, annoying insects. People often associate fleas solely with pet owners, but that's not always the case. These pesky pests can also live host-free in your yard. Often, they will make their way into your home with the help of neighboring pets or wild animals, such as foxes. Fleas reproduce extremely fast and lay a lot of eggs in one go. These eggs then stay protected until triggered by the presence of a host. There have often been cases of people moving into a new home, to quickly end up with an infestation of unwanted fleas. Tiny, and almost impossible to see with the naked eye, fleas are remarkable jumpers and move very quickly. For this reason, it can be hard to know when they are present in our homes and on our pets, until they bite. A good thing about fleas is that they don't like human blood. They prefer our furry family members. However, that doesn't stop them from trying. Occasionally, they will jump on to us for a quick taste. Because they can't live on humans, though, they leave just as swiftly. Flea bites are relatively easy to recognize, and are usually visibly different to mosquito bites. They appear as small, red bumps with a type of ring, or halo, around the center. Unlike mosquito bites, flea bites are generally uniform in size and they aren’t usually very big. Like bed bugs, fleas also often leave bites in a pattern. Usually, these bites are in small groups of three or four. They can also occur in a straight line. Flea bites often show up around the lower legs, ankles, and feet. This is because fleas jump to us from their favorite hosts, our pets, which often stand at around that height. Fleas sometimes hide in carpets or rugs too, so your ankles and feet are within reach as you walk past. If you lie down on the rug, they can bite you almost any place. Flea bites can be quite painful. The area surrounding the bite becomes red and sore and you may experience a burning sensation. Some people will even develop a rash around the bite site. Fleas aren't dangerous to humans, but they do pose a risk to your pets. Fleas may also carry diseases. Young pets, such as kittens, can experience anemia and severe blood loss if too many fleas are living on them. There are more than 120,000 species of fly in the world. Some of these bite, while others don't. The sand fly is one of the most common biting flies that inhabit the southern states of America. In many ways, sand flies are quite similar to mosquitoes. For example, sand flies like warm, humid environments and their favorite breeding ground is a place with lots of moisture, such as moss. Another thing that sand flies and mosquitoes have in common is the fact that the adults feed on nectar and plant sap. Only adult females feed on blood from a host. What Do Sand Fly Bites Look Like? Sand fly bites are red and can be very painful. Blisters may also be present around the bite area. If bites, or the resulting blisters, become infected, this can cause severe inflammation and result in dermatitis. Unfortunately, these flies also carry diseases, including leishmaniasis, which can pass to humans. This disease is not as common in the United States as it is in some other parts of the world. Most people who contract the disease get it while traveling overseas. While there is no vaccination available, it may not be completely necessary; leishmaniasis is not a life-threatening disease. The condition will cause skin sores or rashes that can last for weeks, or even months. These unsightly and annoying skin sores will usually clear up on their own, however. Their name might make them sound like a peaceful bug, but these larvae are no fun at all. Chiggers are from the arachnid family, they resemble ticks, but have a bright red color. Chiggers are also known as red bugs or red mites. Chigger habitats include tall grasses, forests, berry patches, and lake areas. They love warm summers but can also be found during the spring and fall if the temperature is still warm. As the temperature drops below 60 degrees, chiggers will become sluggish and inactive. When winter approaches and the temperature reaches 42 degrees and below, they will die. Unlike other biting insects, chiggers don't feed on blood. They prefer bodily fluids. Their bite contains an enzyme which breaks down skin cells and creates a liquid. The host’s affected skin cells will then harden, creating a sort of tube or straw which the bug will feed from. Chigger larvae act like ticks in that they will attach themselves to a host and feed for up to four days at a time. People who have been bitten by chiggers are left with a bright red bump. The bumps will continue to grow even after the chigger, or more likely, chiggers, have departed. Victims of chiggers don't usually feel the bite or latching on of these critters. Some people don't even notice they have been a host until the pests have gone. It is only the larvae which bite humans. These tiny larvae are no bigger than 0.007 inches long. They are usually found hanging on to tall grass or vegetation. From there, they jump to any victim who happens to walk by. Chiggers have claws to help them grab on to the host. They like to stay in moist areas of the body, such as the armpits, behind the knees, groins, and underneath skin folds. The most common symptom is itching, and lots of it. People have reported feeling an immense desire to scratch the affected area. An unfortunate place chiggers like to attach themselves to is the groin area of men. A bite here can cause unpleasant side effects, such as extreme itchiness and even painful urination. Many insects and bugs will bite humans. Some will cause a great deal of discomfort and even pain, others you won't notice until after you’ve been bitten. Nevertheless, it's crucial to not give in to the temptation to scratch. Scratching can cause further inflammation and could even leave you with scars. The best thing to do after a suspected insect bite is to wash the area with cold water and soap. Applying something cold should also help ease any discomfort.